Robotic Automation is the Australian distributor for Motoman Robots which can be used for a variety of applications including arc welding, spot welding, palletising, materials and machine tending. 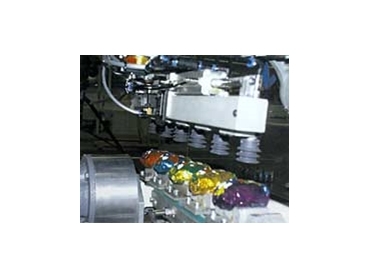 The Motoman SV3 Robot available from Robotic Automation has been installed for handling chocolates in Cadbury plant. According to Richard Taylor Cadbury's Project Manager, "Profitability has been improved and the risk of repetitive strain has been removed as a result of the installation". Richard Taylor added, "Evaluation of Cadbury's requirements covered various methods including Cartesian robots however the selection of 6 axis robot was justified because its increased dexterity reduced tooling costs and allowed more flexibility in the design of the work station. Vision systems were not required because control of the product is maintained the whole way through the process." "Once it was determined that a 6 axis robot would be used the project was carried out in house. The selection of the Motoman robot was made on the basis of cycle speed, compact design and cost. The gripper design was determined to be the greatest area of technical risk, this risk was successfully minimised by including it in Robotic Automations supply scope of supply." Cadbury's have just installed a Robotic Easter egg de-moulder just prior to foiling machines; this uses two Motoman UP 20 robots. The Motoman Robot features pre-assigned I/O and made the electrical installation very easy.